Both these signs want to relate to a partner, they just go about it in different ways. Light and airy Sun in Libra will have difficulty handling Moon in Scorpio’s intense moods. Scorpio will push for brutal honesty, while Libra will try to keep things sweet. Sun in Libra is focused on maintaining harmony. Whether he’s chatting (and flirting) with someone he’s just met, or having an intimate evening with his partner, he’s all about making sure the other person is happy. 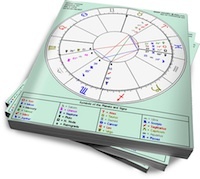 People accuse Sun in Libra of being shallow, but his uber-graciousness comes naturally; he automatically relates to others and sees their point of view. Although he can overdo this and end up becoming a reflection of his lover’s desires, he’s one of the most courteous, sensitive partners around. Moon in Scorpio needs raw intimacy. Part of this is due to her passionately intense nature, but she’s also deeply suspicious and doesn’t feel comfortable (with her partner) until she has experienced every inch of him (inside and out). Her lover should have a high tolerance for no-holds barred confessions, while respecting her privacy and personal space when she withdraws. Periodically, Moon in Scorpio will need a time out, and attempts to jolly her out of this mood will not work. Although she can be a deeply loyal and healing partner, her Shadow can emerge as manipulative, possessive and controlling. Sun in Libra may always feel a bit unbalanced around Scorpio. Whether she’s pushing him to “be honest,”or stewing with jealousy over his flirtations, her intensity may feel like an assault to him. Moon in Scorpio will feel frustrated, and sometimes disgusted, with what she views as Libra’s shallow approach to everything. This will be a difficult relationship, but the saving grace will be each partner’s desire to be in a relationship. Libra will want the trappings of partnership, and Scorpio will crave the emotional intimacy. Although they’ll never be totally comfortable with each other’s approach, they might be able to make this work if there are enough binding contacts in their synastry. I am in this combination. Relationship I am the Scorpio moon. My sun is Leo his moon is Pisces. It has been a dollar coaster ride but we still hang on. Need help?